Life has its own beat. People are born and people die; however nothing prepares us for the emotional toll of continuing life without a special loved one after they have passed away — especially when the next family milestone occurs and we wish for our loved one to be physically joining us. Regardless of their age, cause of death, milestone occasion or family dynamics, the loved one is missed in so many ways that are often impossible to communicate. When my husband passed away when my daughter was 2 years old, I panicked about who would walk her down the isle and my overwhelming sadness that he would not be physically present for such a monumental occasion. Although so overwhelming and sad at the time, I now know that when the time comes for my daughter to be married I will include him at the wedding in a meaningful and loving way. The dynamics of including our loved one at a milestone event are complicated as there is an emotional tug-of-war between the grievers and the attendees. Guests may question the need to add more emotions to an already moving day; and may even view the gesture as morbid. Why would we make a toast or reference to those who could not physically be with us on such a special day? Is it fair to the family of the bride or groom not connected to the loss? Create a special table of pictures of those who have passed. Share a story of the past relationship. Pinterest and other websites offer wonder ideas of creating a warm and loving table following the theme of the wedding. 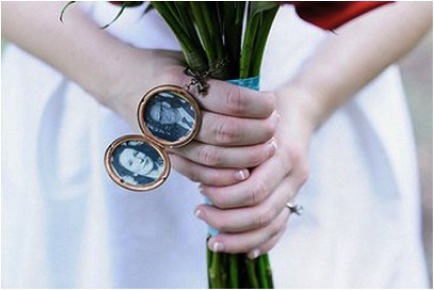 Include a personal article of your loved one as part of your wedding ensemble. Consider wearing a watch, piece of jewelry, wedding dress, fabric from their wedding dress, tie, or cufflinks. Embrace the history of your loved one by mentioning them in a congratulatory speech, reading during the ceremony or in print in a program. When creating a family video, be sure to include your loved one. Memorialize your loved one by including their favorite food as a menu item or choosing a venue based on memories of the past. Light a candle in their honor and share a quick story. Save an empty chair, place a rose on the seat. ← Previous Previous post: Should divorcees be granted bereavement leave?